Sumter, SC, February 02, 2018 --(PR.com)-- The NFL has come under much scrutiny regarding player safety in the last several years. During this period, Turf Nation has quietly become the dominate brand in the synthetic turf industry. There are many large competitors within the synthetic turf industry, Turf Nation is far from the largest by volume, but work hard every day to be the best, and it would seem that prominent NFL teams have noticed the difference. “4 and 4” announced Sid Nicholls, President of Turf Nation, explaining that Turf Nation has manufactured 4 NFL Super Bowl surfaces, which ties Turf Nation with the number of natural grass fields used in the last 10 Super Bowl games. Warrior Turf is the Authorized Dealer for Turf Nation in North Carolina and South Carolina. Based in Sumter, South Carolina, Warrior Turf’s President Kevin Taylor is focused on ensuring the safest surfaces for player of all ages in region. 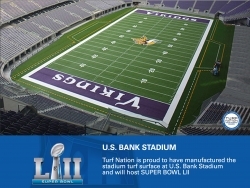 “The fact that Turf Nation is now equal to the existence of nature grass over the last decade in the NFL biggest game is significant,” stated Kevin Taylor – President of Warrior Turf and former Field Manager for NRG Stadium (home of Super Bowl LI). Many people have inquired about Turf Nation's surface success and Warrior Turfs strategy to promote the 4th Super Bowl surface by the group. Clearly an association with the NFL can elevate any brand, but what if you don’t have the budget for multi-million dollar commercials and full page program ads? Warrior Turf staff, led by Kevin Taylor, who was responsible for the field at NRG which was utilized in last season’s NFL Super Bowl, offers a full platform of sports surfaces, from synthetic to natural grass, specifically engineered for football, soccer, golf, etc. Turf Nation’s synthetic turf systems are proudly manufactured in the USA. “Quality is our differentiator, if you build the best surface, people do notice,” says Taylor. Based in Sumter, South Carolina, Warrior Turf is the Authorized Dealer for Turf Nation for North and South Carolina. Warrior Turf is a premier sports field construction and maintenance specialist for professional, collegiate, scholastic (K-12), and recreational athletics. We offer services in the following areas: sales, consulting, installation(s)/removal(s), pre-project planning, post project support, education/training, sales of supplies/equipment, laser grading, field testing, fertilizer/chemical sales, field paint, golf course services, and field maintenance services. Additional information is available at www.warriorturf.com. If you would like more information on this topic, please call Kevin Taylor at 843-991-6310, or email kevint@warriorturf.com.